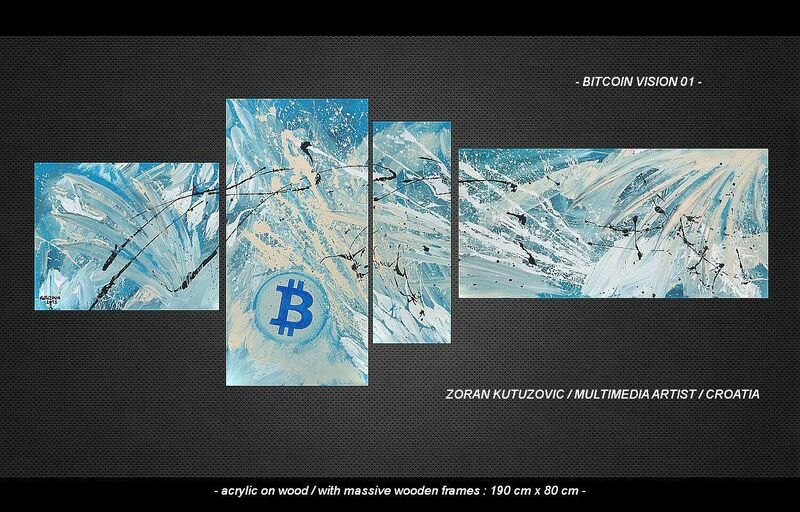 Whenever I see Bitcoin art, it’s usually accompanied by the Bitcoin logo. Now don’t tell anyone I said this, but I don’t like the Bitcoin logo. I don’t like it anymore than I like the dollar sign. Neither of these symbols contains anything remotely close to putting a twinkle in my aesthetically sensitive eye. That being said, I do so love the concept of Bitcoin, and I want everyone to love that concept like I do. I want them to understand that Bitcoin will make the world a better place and make rainbows sprout from every puddle. For this, the magic internet money must be viewed as more than a tool, a method of payment. It must be viewed as an ideal, a philosophy, a symbol of hope. And while the developers and their world of techies debate politics and technology and in some cases cry the death of Bitcoin, the rest of the public ultimately still needs to understand and embrace the intrinsic societal value of Bitcoin—even if they don’t fully understand the tech—for it to be successful. This is why we need artists. They are specialists at bridging gaps. They can bridge that gap between the brow furrowing pragmatic crypto-economo-techno babble of the experts and the every-person’s desire to believe that there are things born of humankind that can help fix all we’ve done to screw things up. Luckily there are some who are up to the task of making even that loathsome icon into something I wouldn’t hesitate to put on the crème colored wall of my expensive two-story condo if I had one. Starting with a splash, this set—along with some of Zoran’s other work—is exactly what I’ve been looking for. Even though it depicts the Bitcoin logo (on which I’ve already shared my thoughts…), it does so while expressing something extra. It tries to evoke a feeling or mood—or whatever you want to call it—around the idea of Bitcoin. In this case, I’m thinking tidal waves. It’s a tad big for the hole-in-the-walls I’ve lived in but boy would I love to hang that set above the pastel blue couch I’ll never have. 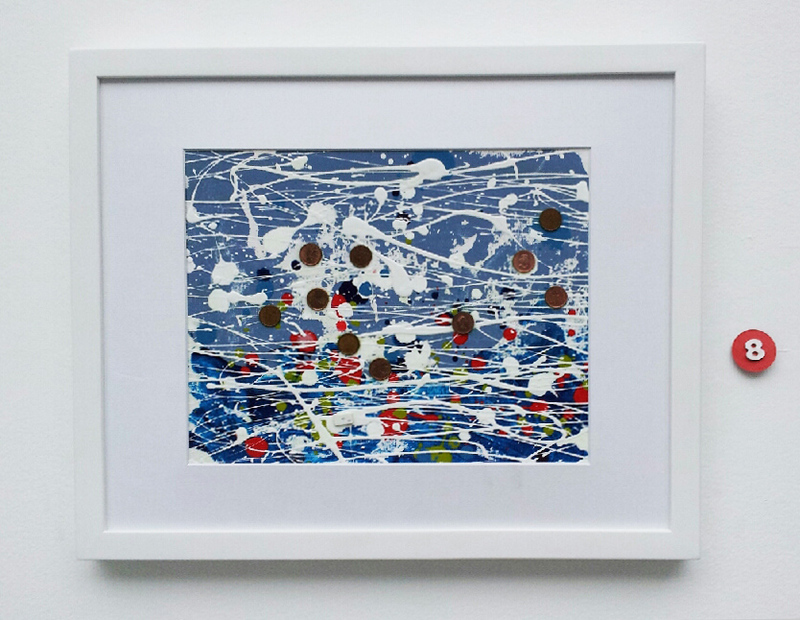 Kuno Goda got the Bitcoin art ball rolling with his 200 Bitcoins in 2013. It was one of the first internationally known pieces of contemporary art dedicated to the cryptocurrency. It was based on Andy Warhol’s 200 One Dollar Bills. Like Warhol, Goda managed to take a subject seemingly devoid of artistic potential and, with simple repetition, create a piece that has texture and relevance, when hung on the right surface. 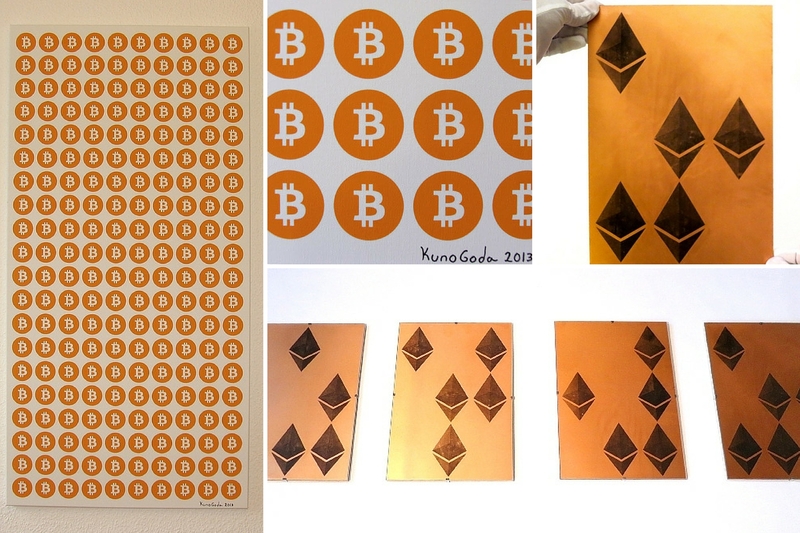 His other piece of crypto-art is Glideth, featuring the logo of the Etherum decentralized software platform repeated in the four permutations of the glider pattern—i.e. the hacker’s emblem—on a copper-clad plate. The subject of Glideth may be a bit more obscure to the general public than 200 Bitcoins, but it’s a nice little wink to hacker culture. 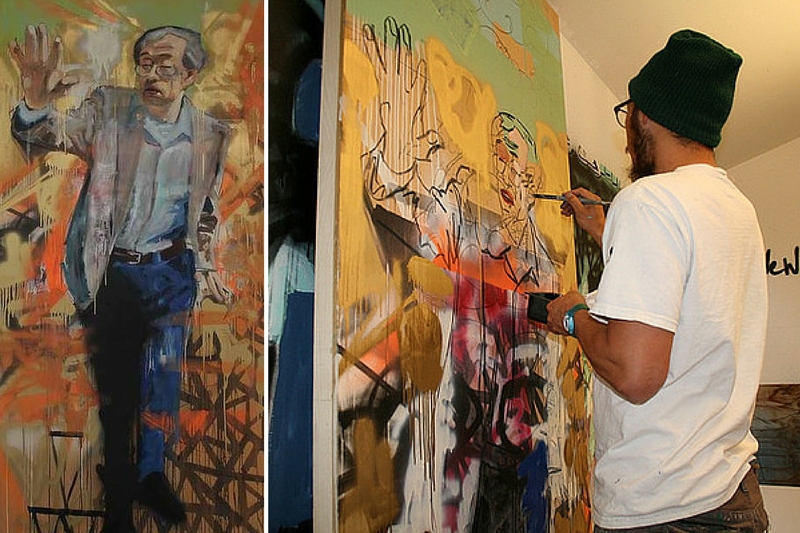 Here we go now: an artist who was inspired by Bitcoin and then… didn’t paint Bitcoin. I wouldn’t have been able to tell you by looking at it that it was inspired by all of Nistoreanu’s transactions on the Cryptsy Exchange. It’s one of the reasons I like it. The other reason is that, if I had a beautiful dark green library with antique bookshelves, ornate dark wood moldings and a vintage French leather club chair lined with golden nails, I would definitely hang this piece in there. This is why I appreciate an inspired artist. Those little Canadian pennies are now out of circulation. “Out with the old fiat currency. In with the new virtual currency” is what she writes in a statement about this piece and nine others she’s created. Without directly relating to virtual currency in the painting, she’s still expressing an idea that implicitly supports it. 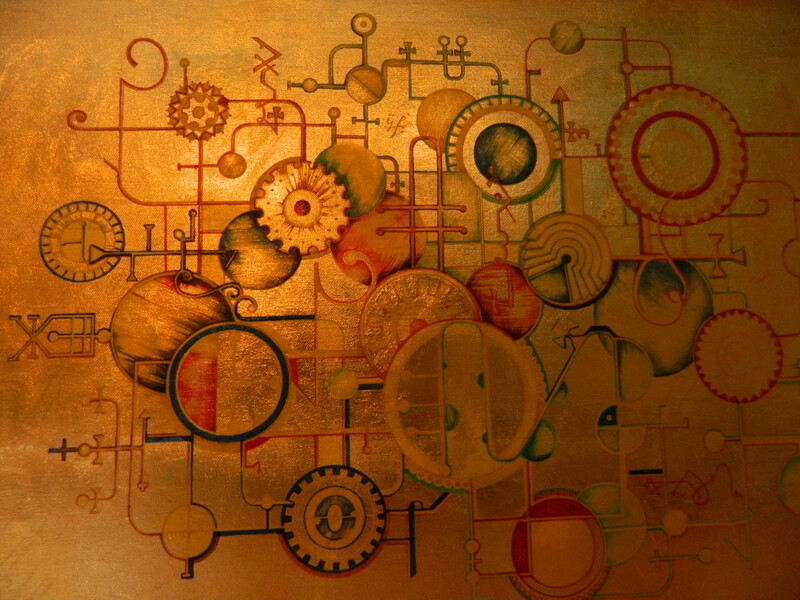 Sure, abstract art isn’t for everybody, and even I may not really want to put this particular painting in my home. But it just might fit nice in the reception area of the ultra-modern office/loft I wish I had. 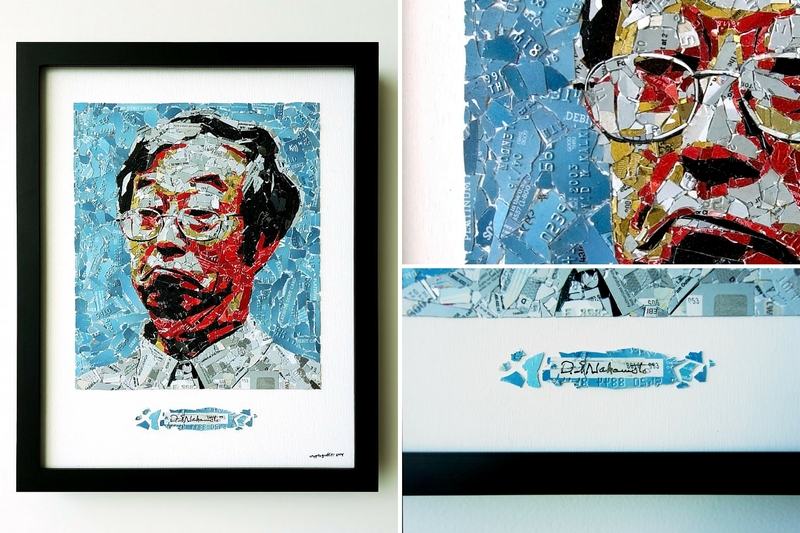 Nick Sumida’s Where’s Satoshi Nakamoto? I happen to like caricature type art and even think it looks nice all framed up and on the wall. There’s a depth of meaning in them that people overlook because of the comic look of them. 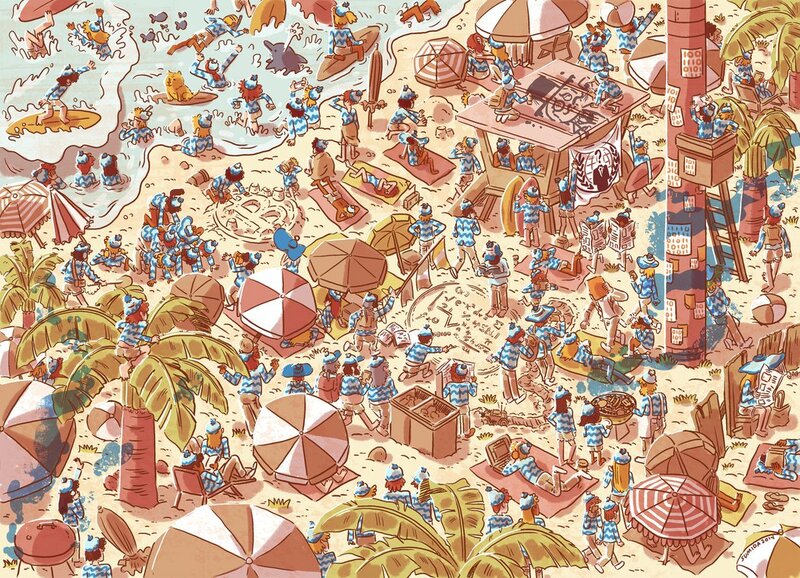 I was also a big fan of Where’s Waldo? growing up. 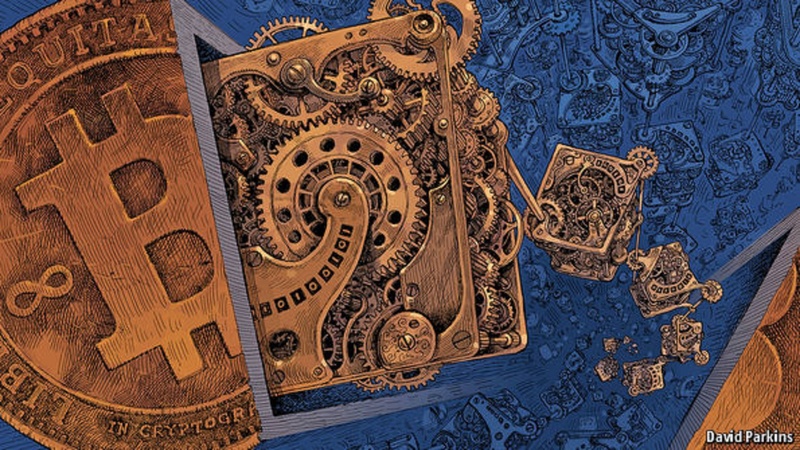 This illustration, which was featured in the New York Times, brings me back to my childhood while also paying homage to the mysterious progenitor of Bitcoin, Satoshi Nakamoto. While I haven’t located the founder quite yet, I have noticed a couple Easter eggs of things related to crypto culture. This one’ll probably go in my corner office on the 100th floor so I can spend my time with my nose two-inches away from it instead of working. This is one of my favorites. Art has a way of defining the greater narrative of life and this one is no exception. Because of an article in Newsweek, Dorian Nakamoto became part of the mythology that built up around the mystery of Satoshi’s secret identity. The picture that is reproduced here using pieces of credit cards perfectly depicts the unwitting man who must have gone through the most WTF? period of his life following the initial article. Though his name has been cleared, he has forever been entered into the larger narrative of Bitcoin’s rise. The proceeds from this piece all go to Mr Nakamoto. I believe this one goes in my living room which overlooks the sea through wall-to-wall windows. Since we’re talking about narrative, we find Dorian here heading towards the interview with the Associated Press that would clear his name and give him a free lunch. In the grand scheme of things, Dorian may not have made huge waves, but the story certainly endeared us to him, which is why I love this large painting of a befuddled citizen surrounded by a world of chaos. The tall painting would go above the chair at the end of the table in the conference room of my huge multinational, his hand raised up to bless us during lunch break. Ok. This one is just a guilty pleasure. The steampunk-esque aesthetic is probably not everyone’s favorite and I’m not likely to hang this on my cliff top mansion’s walls any time soon. But as far as article cover pictures go, I think it’s pretty neat. 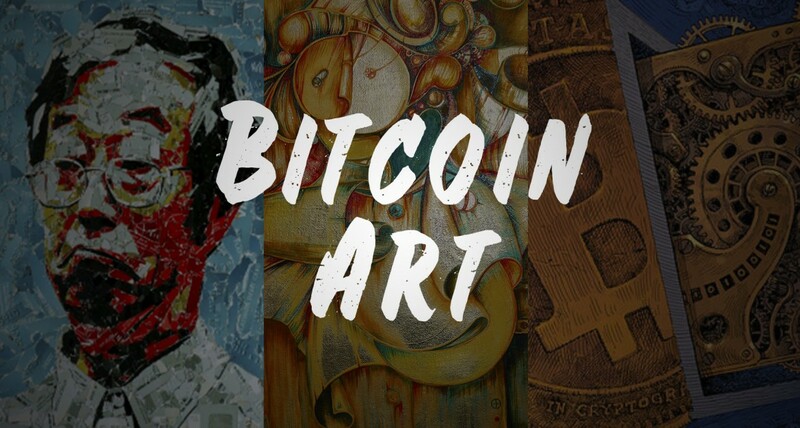 There are more and more great artists out there with work featuring Bitcoin related themes and we couldn’t include them all (though we might just make another post with a whole new batch of artists eventually). Now, maybe these art pieces haven’t left you feeling as though you briefly touched the infinite mystery of the cosmos. But they might still serve as inspiration to all of us bitcoiners that we shouldn’t give up fighting for adoption. And they might also present Bitcoin from a different perspective to the general public, one that could change how people view it, spark their curiosity, and open their minds to all the possibilities. I like this article. You just came out with our ideas. We’ll keep in touch as soon as we have finished our project. Hey thanks! Can’t wait to see what you guys are up to!